In a recent survey, the World Economic Forum examined the working world of the future in context with the fourth industrial revolution. The predicted changes in the working world will also bring along shifts in the required spectrum of competencies. Of the core competencies that will be required in 2020, today roughly one third is still seen as unimportant. The shift will affect all business sectors, but to different degrees: In the media sector, about one fourth of the requirements will change, in the finance segment, however, more than 40 percent. At present and in the future, the most important competence is the ability to solve new, poorly structured problems in a complex environment. This is followed by an array of social skills, among them coordination with others (in a team), emotional intelligence, service orientation and negotiation skills. 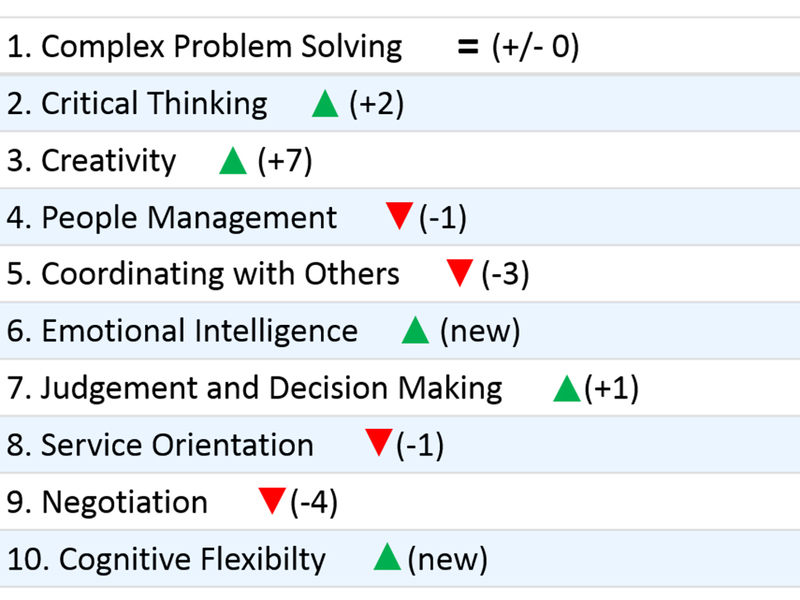 Comparing 2015 and 2020, cognitive abilities such as creativity and cognitive flexibility will make the biggest leap to the top, while quality assurance and active listening skills will disappear from the list of the top 10 competencies. Academic studies are naturally focused on subject-related expertise of the relevant academic discipline. This also applies to the fields of economics and business administration. The studies teach the most important and fundamental theories, for example in finance, accounting, marketing and management. The theoretical knowledge taught in the lecture halls, however, does not automatically translate into decision-making and problem-solving skills in practice: Many university graduates suffer a so-called “reality shock” at the transition from their academic training to professional life. For gaining a deeper understanding of the theoretical content – in particular in disciplines of social science, such as business administration and economics –, prompt testing of the theories and tools is necessary – as well as, vice versa, a re-connection of practical experience with the process of acquiring knowledge. The competence field of knowing refers to the theories and methods that are required for a successful company management. The competence field of doing refers to practical application of the expertise to exemplary or real situations. The competence field of being focuses on personal values and goals as well as self-reflection. Interesting challenges emerge in particular at the interfaces between the three competence fields. Innovation research refers to the gap between knowledge and action as the Knowing-Doing Gap (Pfeffer & Sutton, 2000). This gap is not only characterized by the lacking ability to transfer learned theories into practice, but also by a series of accompanying factors which have the potential of adding up to complications during practical implementation. Consequently, implementation and problem solving skills imply much more than just being able to transfer theory onto a practical problem. In general, the issue of the right relationship between knowing and doing and the interdependence between the two of them is of primordial importance in a highly volatile world. To start with the doing only when complete and reliable information on all potential consequences is at hand is not an option, in particular not in a dynamic environment. On the other hand, swift and unthoughtful action may cause major damage. To understand this interdependence and to consciously experience it with the help of practical examples is therefore an important learning objective for attaining problem solving skills and for forming good decision-making skills and responsibility. In parallel to the Knowing-Doing gap, discrepancies between knowing and being and/or doing and being may arise in context with this model. No doubt, man always remains a “human being” and not exclusively a “human doing” or a “human knowing” in the environments of the working world, too. 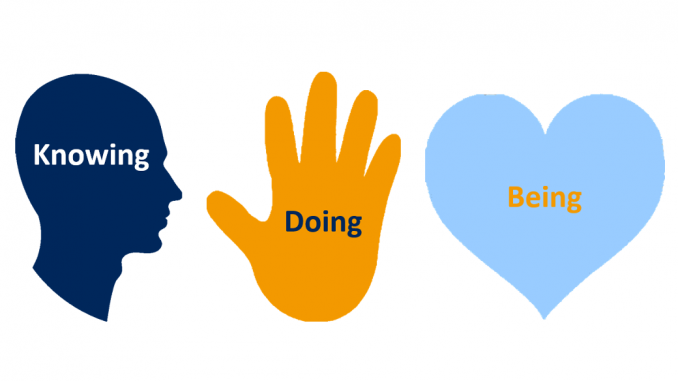 A Doing-Being Gap, for example, may emerge in context with ethical issues, when doing is in conflict with own values and/or the values of other stakeholders. Actively looking into own values but also into the values of others (e.g. other individuals, but also other cultures) is indispensable for any management training. It directly boosts essential competences such as emotional intelligence, people management competence and negotiation skills. Actively scrutinizing one’s own personal value system, in addition, secures the long-term capacity to act even in new and unknown situations. A gap between knowing and being may occur if the knowledge that is taught only refers to subject-related expertise and is totally disconnected from the student’s own living environment and experience, so that he/she cannot make the connection to his/her own value system. 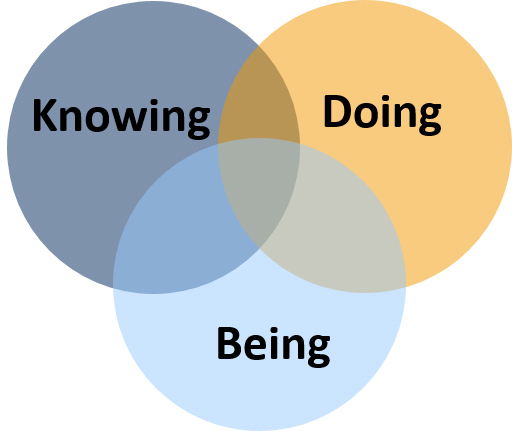 Knowing – doing: In problem-oriented learning, theories and tools are taught in context if possible. On the subject level, the Bachelor International Business study program has no separate modules for business mathematics. Instead, the required mathematical knowledge is taught as an integral part of practical application. Concepts of financial mathematics, for example, are a part of lectures on finance and statistical methods are imparted in context with market research. Social skills are trained in addition to technical and subject-relevant expertise, and this expertise gained from the relevant workshops (e.g. on communication or negotiation techniques) is applied in practice in case studies or projects. 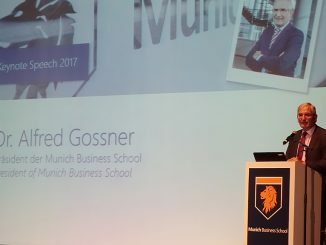 Knowing – being: The Success Factor Happiness course in the Master International Business study program treats theoretical concepts for happiness by means of case studies from the economics and business context. Simultaneously, exercises are aimed at encouraging students to examine their personal concept of happiness and their life plan. Being – doing: A facultative painting workshop encourages students to get involved in artistic activities – without much theoretical superstructure. This brings forth sleeping talents; while feelings and emotions are expressed artistically, courage to dare creativity is enhanced. 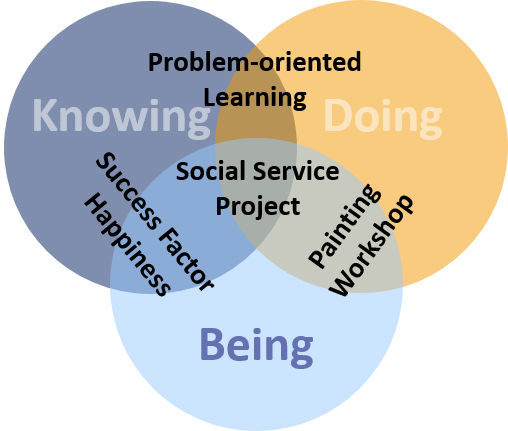 Knowing – doing – being: The Social Service Project during the basic studies of the Bachelor International Business program teaches theoretical knowledge in project management which is directly tested in practice by co-operating with a social institution. This implicitly requires the active involvement in other living environments, which in turn impacts the student’s understanding for his/her identity and value system. Modern management training suitable for the year 2020 includes in-depth subject-related training just as much as targeted encouragement and formation of other future-oriented competencies. 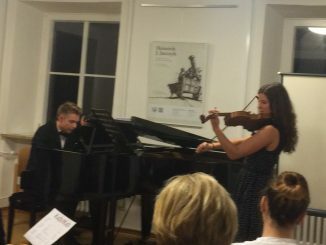 Collaborative and context learning within the spectrum of the competence fields– knowing, doing and being – as presented here, offers an excellent foundation. This innovative teaching and learning concept, however, requires small student teams and close contact between teachers and learners. It requires courage from both sides to leave beaten tracks and try new concepts. For both sides, it means to clearly put in more effort than the mere academic graduation would require. But in addition to the academic degree, the final result will include a balanced formation of competencies including the fields of knowing, doing and being.